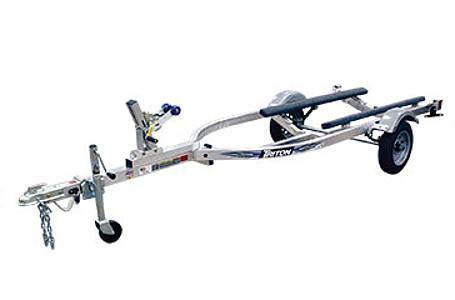 The perfect trailer for any full size Sea-Doo including GTi, GTX, RXT or GTR. All aluminum, won't rust. Comes with front wheel jack, led lights, large diameter tires, integrated rear racheting tie down straps and more. One of the nicest trailers on the market. Tire/Rim & Axle Choice: #06509 4.80 X 12C; Optional: #08875 ST145/R12E, #10384 ST145/R12E ALUM. 1785 lb. ; Optional: 1805 lb.